Brand: Tots in Mind Inc. This recall involves about 20,000 dome-shaped white-colored mesh tents designed to fit over playards as small as 28 inches by 40 inches or as large as 31 inches by 44 inches to contain a child (and 85 in Canada). There are 12 plastic clips to secure the base of the tent to the top rail of the playard through button holes along the bottom of the tent. The tent has a zippered side for putting in and taking out the child. 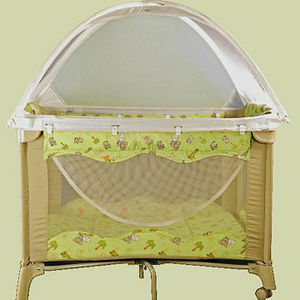 Walmart, Amazon.com and various baby and children's stores nationwide from January 2005 through February 2010 for about $60.